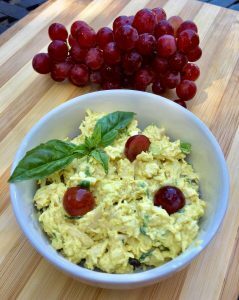 I recently brought this to a party and people couldn’t get enough of this chicken salad with coconut yogurt. They loved that it was mayo free with tons of flavor and added crunch from the toasted almonds. I love that it contains good fats – monounsaturated fat from the almonds and medium chain triglycerides (MCT) from the coconut. Monounsaturated fat can help lower your LDL and raise your HDL and MCT can actually increase your metabolism. Plus, the grapes, onions, basil and curry contain antioxidants and help reduce internal inflammation. There are a few different brands of coconut yogurt but I really like the one by COYO. It’s smooth, creamy and very thick. That’s why you’ll need a little water to thin it down. Enjoy this on top of a salad, with crackers and even as a filling for lettuce wraps. In a large mixing bowl, Add the coconut yogurt and add a few tablespoons of water to thin it down. Stir until the consistency is like mayonnaise. Add the curry powder, salt and pepper and mix until you get a nice yellow color. Add the cooked chicken, slivered almonds, grape halves, green onions and mix until just combined.